One Saturday before camp opened at Bert Adams in Covington, the property received two distinguished visitors. Mr. Robert Woodruff, of The Coca Cola Company, and Mayor Ivan Allen rode into camp to visit the Dining Hall named after Mr. Woodruff. As E.P. “Penny” Jones recalls, Mr. Woodruff rode into camp in the biggest limousine he’d ever seen. They drove the massive car throughout camp despite the lack of paved surfaces. They even drove the limousine down through the woods to the campsites where the Scouts stayed, at the request of Mr. Woodruff. 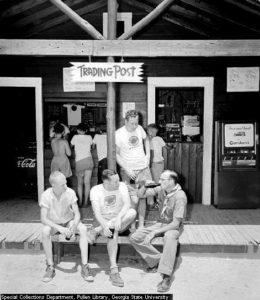 On their way through camp they passed by the Trading Post, which Mr. Woodruff also wanted to visit. On his arrival the doors were propped open with cases of Pepsi. The camp’s business manager was having trouble reaching the Coca Cola Company, only to have the CEO show up on his door step. A fresh shipment of Coke was brought in, the Pepsi removed and the Trading Post opened the next day to serve ice cold Coca Cola to Scouts for the rest of the summer. For more stories and photos from the history of Bert Adams visit the Bert Adams Boys historical site. Tagged Bert Adams. Bookmark the permalink.